It was sad to see shell of Hasim Rahman sleepwalk through three rounds. Local Anthony Nansen (30-5 as a Kick Boxer) was able to move around and out score the 41 year old former heavyweight champion of the world. Rahman, inactive since a two round knockout at the hands of Alexander Povetkin for the WBA belt in September 2012, tried and edged the second, but it just wasn’t there, his right hand repeatedly missed the mark or caught gloves as the Kiwi circled away. Eastside’s score: 29-28 Nansen. In a close bout, Brice Ritani Coe showed the benefits of working in Las Vegas sparring countryman Joseph Parker and other notable big men to take the points over American Alonzo Butler whose work rate and conditioning let him down. 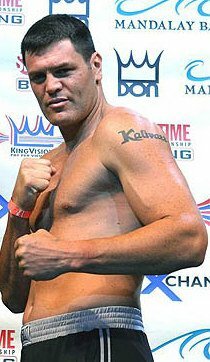 Australian heavyweight champion Hunter Sam gave one time WBO title challenger Kali Meehan a difficult three rounds. Kali showed signs of ring rust being out for 27 months. A hard left rip late in round one had Hunter on his bike and a right underneath in the third sealed the fight for long time contender Meehan. Sam countered well throughout and stole the second heat in the final ten seconds as he fired away with Kali in a corner. Hunter threw flurries with both hands in spurts but it was Meehan who landed the heavier punches. Eastside’s score: 29-28 Meehan. In a bruising match up between former Commonwealth champions and Prize Fighter winners, Michael Sprott stunned Martin Rogan with left hooks to dominate the opening round before the Irishman came back to take the second stanza setting up a torrid deciding three minutes. Both men worked hard and pipped the Meehan-Sam clash as the best fight of the quarters. Eastside’s score: 29-28 Sprott . Michael Sprott showed no ill effects from his quarter final, showing his class and experience, taking a comfortable decision over novice Nansen. Sprott was more composed, working his solid jab over time, connecting one twos through Nansen’s guard and digging in heavy rips to the body. Nansen got in with some nice short left hooks but Sprott produced a text book display, leaving something for the final as he boxed along in the third taking no risks. Brice Ritani Coe barely got out of the first round as Kali Meehan bombed away sending his man stumbling to the canvas with a series of hard head shots finished of by a right hand. Meehan began the second well, loading up before Coe was able to get home some shots of his own, noticeably a right a minute 15 in and a left hook with a minute left. Coe came out swinging at the start of the third and finished the fight on top, forcing Kali to hold on but it was not enough as needed a knockout to win. Both gave everything in a hard fought encounter. In a shoot out, Kali Meehan stopped Michael Sprott in the first round. Sprott got the first telling shot in – a left hook that had Kali holding along the ropes thirty seconds in. Meehan rocked Sprott right hand half way through round, going for each other with hard shots. At the 2.25 mark, Sprott wobbled after a sharp right hand and went down soon after. Sprott beat the count but his legs were gone and after another exchange he stumbled to the floor and was the slugfest was stopped with seven seconds left. Meehan, who struggled through the last round in his semi final, saved his best for last. Meehan, who was born in Auckland but has been based in Australia since 1998, collects a $200,000 winner’s cheque. Sprott takes home $100,000.